A rhenium-based nanoparticle containing equal amounts of sulfur and selenium, yet missing some sulfur atoms (bottom right), proved to be the most effective electrocatalyst. Credit: American Chemical Society. When hydrogen burns, it produces only water as a by-product, making it an attractive clean fuel for vehicles and other energy applications. However, most of the world's hydrogen is currently produced using fossil fuels in a process that emits large amounts of the greenhouse gas carbon dioxide. Researchers are thus looking at making hydrogen by splitting water using electricity generated by renewable sources. These electrolysis systems typically use electrodes containing catalysts, which accelerate hydrogen production and reduce the amount of electricity needed to drive the hydrogen evolution reaction—one of the two reactions involved in splitting water. Now, Yonghua Du of the A*STAR Institute of Chemical and Engineering Sciences, working with Hua Zhang's group at Nanyang Technological University, has investigated the catalytic abilities of nanomaterials based on rhenium sulfide selenide. The researchers focused on a phase that contains zigzag chains of rhenium atoms between buckled layers of sulfur and selenium. They used a chemical reagent to insert lithium between these atomic layers. Adding water triggered a reaction that cleaved off dots of material just 2 nanometers in size. The team then tested nanoparticles containing varying proportions of sulfur and selenium. 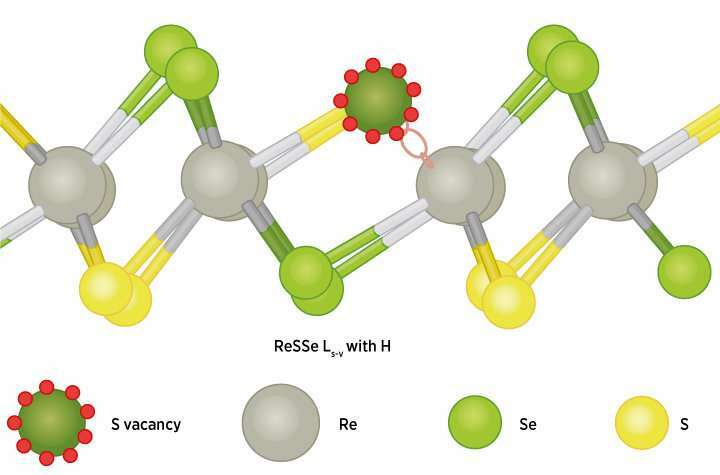 The material with equal amounts of sulfur and selenium had the best catalytic performance, requiring the lowest voltage to catalyze the hydrogen evolution reaction. This particular material was also highly stable, showing negligible performance loss even after 20,000 testing cycles. To understand the origins of this catalytic activity, Du's team used X-ray absorption spectroscopy to study the arrangement of atoms in the nanoparticles. They found that the process used to create the nanoparticles could also create defects by knocking out sulfur atoms from the material's structure. Zhang's group performed further experiments and theoretical calculations to show that these defects improved the nanoparticles' catalytic activity by allowing a charge to build up on rhenium atoms next to the site of the missing sulfur (see image). "Defect engineering has proved to be one of the most effective ways to improve the activity of catalysts for electrocatalytic hydrogen evolution reaction, and X-ray absorption spectroscopy is a key technique for unraveling the defects in nanomaterials," says Zhang. The researchers say that this approach to understanding catalytic activity should help in the design and synthesis of other high-performance electrocatalysts.